I said this coming from a place where so many other things seem to take precedence. Like, flowers? Really? Who’s got time for that? I heard myself say this to my mom in a way that stuck with me. Like growing flowers is a measuring stick in my relationship with time. It somehow signifies a balance. And it definitely invites me to be a willing participant in this relationship with time and make of it what I wish. Because if I didn’t ‘claim’ my time, something else would. Interestingly enough, there seems to be a correlation between having space within the body and being able to feel more aligned with my external surroundings. Do you ever notice that? Feeling a little freer in the body leads to a greater sense of balance. When there is a lot of pressure felt through the body, it can send you off kilter. Myofascial Release allows you to claim some space in your body. A spaciousness from within does absolute wonders for the environment around you. It can bring a new perspective that shows you things you may not otherwise notice if there were undue internal pressure. Group Therapy gives you a chance to relieve such pressure! As summer approaches, there are a few more chances to join in a class here at StillPoint MFR. Gather, stretch, compress, release. Move, breathe, expand, let go. THIS SATURDAY is the LAST First Saturday of the Month until the fall. Join us on June 2 at 10 am. Saturday Group Therapy classes are quite special. Claim your time and space! Tuesday classes will be going through June. Group Therapy classes will then be on Summer Break! We will return in the Fall when the evenings cool back down. Even though I don’t necessarily feel like I’m at the stage of my life where I have time to grow flowers, I am making efforts to claim that time! The flower above is from some seeds I spread last summer after that conversation with my mom. 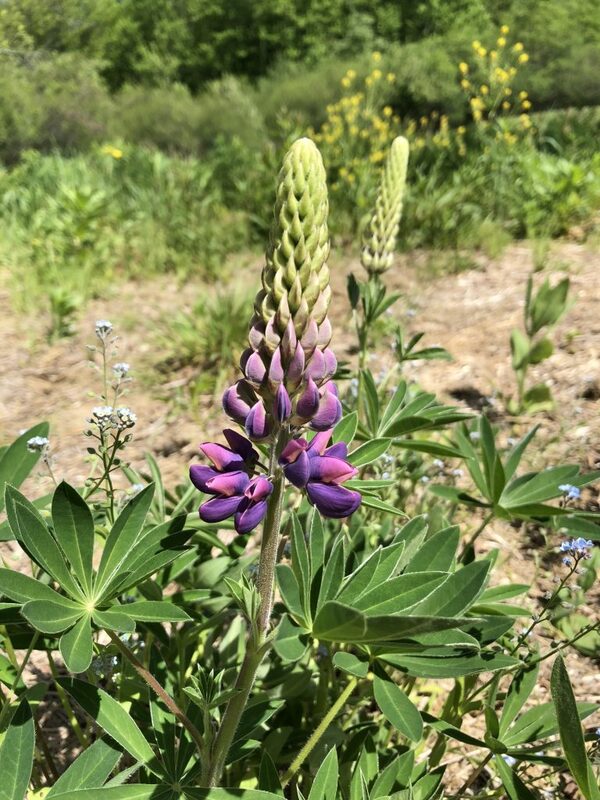 The Lupine is the first to bloom. I seriously gasped when I saw the little baby bud. I smiled so big, wishing my mom was there to see it! I think the flowers are going to have A LOT to say. I bet they are FILLED with wise wise messages. (I mean, the veggies sure are! I can’t imagine what the beauty of the flowers have to teach, as they grow).